Watch us surprise Moms at a Moncton retirement home. Moms are the heart of the home. The centre of the community. That’s why we wanted to do something special for Mother’s Day. Because Moms deserve to be celebrated. We told a group of nine women at a retirement home in Moncton that we were filming a documentary on motherhood. But that was only part of the story. Watch the video and see them get the surprise of a lifetime. Bringing better to your community. Building better within the community. Discover how Enbridge Gas New Brunswick brings better to life in our community. We are as New Brunswick as the Acadian Coast and the Miramichi River. We are from a place so beautiful that our license plates don’t require taglines. We are as New Brunswick as the moose that roam the sides of the Route 2 because we are Enbridge Gas New Brunswick – a New Brunswick company. We understand what it means to be from New Brunswick because our employees live and work here. To date, we have invested over $500 million in our province and created over 400 industry-wide jobs. It is important to us that we give back to the communities we serve because it’s our community too. We didn’t plan a meal filled with foods that would make her smile. And we didn’t make sure everything was absolutely perfect. But we did help you cook the meal that reminded her just how special she is. 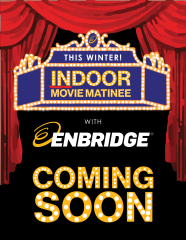 At Enbridge, we believe when the energy you invest in life meets the energy we fuel it with, beautiful things happen. Our Fuelled by Community video series features a collection of our contributions to the communities we serve. They are filmed through the eyes of the real people who live and work here in this great province. Browse through the short films and learn how Enbridge Gas New Brunswick is helping fuel the future for generations to come. We're bringing our famous FREE Movies INdoors this Winter! Fredericton - FHS Gymnasium, 300 Priestman St.
Oromocto Community Center, 66 Miramichi Rd. Fredericton - Nashwaaksis Field House, 324 Fulton Rd. Oromocto - Oromocto Community Center, 66 Miramichi Rd. Moncton - The Journey Church - Allison Campus, 1539 Salisbury Rd. 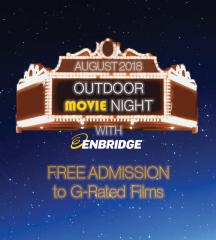 Join Enbridge Gas New Brunswick and the United Way for FREE outdoor family movies in August 2018! Bring lawn chairs and blankets! Movies start at dusk -- as soon as it's dark enough to see the screen. See you in the parks! Enbridge Gas New Brunswick is committed to sponsoring community events and charities in each of the communities we serve. We support organizations in our service areas that focus on environmental, health and safety initiatives, education, and community development as they relate to our goals and values as an organization. We value and appreciate our friends in the community that are doing the same and who are hard at work making a difference in the communities we serve. See a few examples of how Enbridge Gas New Brunswick has made a difference in your community. Let’s be friends. Let’s help out together. Let’s share in our community. For sponsorship requests and information about the Community Investment Program, contact us. Please ensure 4-6 weeks before your event to allow for adequate time for us to review the request internally.